The Big Vote elections saw 14,258 votes cast for 39 candidates across 30 schools and colleges, with the winners being announced at a special event earlier this month. Those elected will represent their peers for up to two years, working hard to give them a voice among decision makers. Harvey Hill, who was elected into one of two seats up for grabs in Upper Rother, said: “I really enjoy voicing mine and others opinions and campaigning on issues close to my heart. The achievements of the previous Youth Cabinet include gaining more awareness and subscriptions to the 3i-D card and developing the scheme further. The 3i-D card functions as an identity card, offering additional discounts on bus travel and new discount are being launched in spring 2016 for shop and leisure outlets. 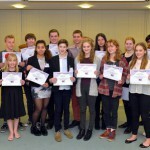 The cabinet also helped to create a new website for young people, www.c360.org.uk by working with web designers and the county council to provide improved online information to young people, from advice and guidance to what groups and clubs are available in the county. 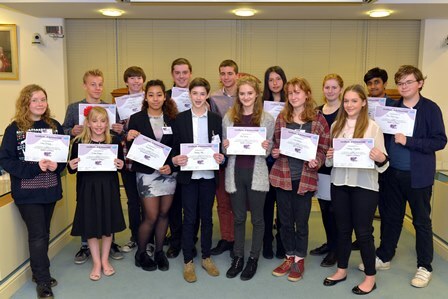 At a national level, the Youth Cabinet’s UK Youth Parliament members have been active on helping to raise awareness of the importance of good quality mental health education and services in East Sussex and contributed to a national report, as part of the Youth Select Committee work into an audit of mental health services and provision in the UK. Cllr Sylvia Tidy, East Sussex County Council lead member for children and families, congratulated the newest members to take their seats. “I’m delighted at the level of interest shown in this election, with 39 candidates vying for a seat and nearly 3,000 more votes cast than the previous election in 2013.